Super Bowl Survey: Who takes the trophy? Super Bowl LIII (53) will be played on February 3rd, 2019 at Mercedes-Benz Stadium in New Orleans. rooms, garages, basements, etc. to see who will become the 2019 champions of the NFL. The New England Patriots, led by experienced quarterback, Tom Brady, came off an upsetting victory over the heavy-favorited Kansas City Chiefs, who were led by MVP Candidate QB, Patrick Mahomes. Meanwhile, the Rams dealt with controversy in the NFC Championship with a crucial missed call in the 3rd quarter, when Rams CB, Nickell Robey-Coleman committed what seemed to be a Pass-Interference flag on Saints Wide-Receiver, Tommylee Lewis. The Rams snuck away with a 57 yard game-winning kick from Greg Zuerlein. With the Pro Bowl in hindsight, the Super Bowl hype is building at an alarming rate. Tom Brady is attempting to win his 6th Super Bowl after coming short against the Eagles with a score of 41-33 last year. 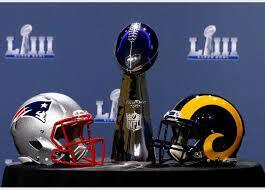 Students showed their opinions on who they thought would win Super Bowl 53, the New England Patriots or the Los Angeles Rams in a survey, where they are asked which team they think will win. Out of 102 responses, 80% said that the Patriots would come out on top against the Rams this Sunday. The other 20 percent have faith in the young Jared Goff and Todd Gurley on the offensive side and a very talented defensive line with Aaron Donald and Ndamukong Suh. Despite Los Angeles’ young talent, the Patriots have the experienced Tom Brady who always comes up clutch in big games. “He [Brady] is going to perform much better under the pressure compared to Goff who has only been playing for 3 years,” Sophomore football player at York, Brandon Walker said. This Super Bowl will decide who is considered the best team in the NFL. It will also mark major points in the careers of Rob Gronkowski and Tom Brady. Brady, who has won five championships with the Patriots, has the opportunity to win his 6th on Sunday. Meanwhile, Gronkowski has been experiencing back injury and is considering retirement. New England has the popular vote to take the trophy on Sunday, but the young talent of the Rams is something that will offer a unique challenge to Bill Belichick’s Patriots.